More cost-effective bandwidth. optimized application performance for cloud-based apps, 100% network uptime, connection agnostic. You want SD-WAN from Triton. Enterprise WANs are becoming increasingly complex to manage. Employee workflows and traffic patterns keep changing. The demand for bandwidth doubles every 18 months (Boston Consulting Group Survey 2015). IT departments struggle to deliver improved cloud-based application performance—and budgets are limiting the amount of bandwidth companies can afford. Traditional networks can no longer keep up. They weren’t designed to support cloud-based apps, as nearly half of enterprise apps are accessed using the internet (IDC Worldwide SD-WAN Survey Special Report, May 2016). Traditionally, companies have coped with this challenge by adding more MPLS bandwidth, or by combining multiprotocol label switching (MPLS) with dedicated internet access, DSL, cable and Ethernet. All have made enterprise WANs complex, costly and time consuming to manage. 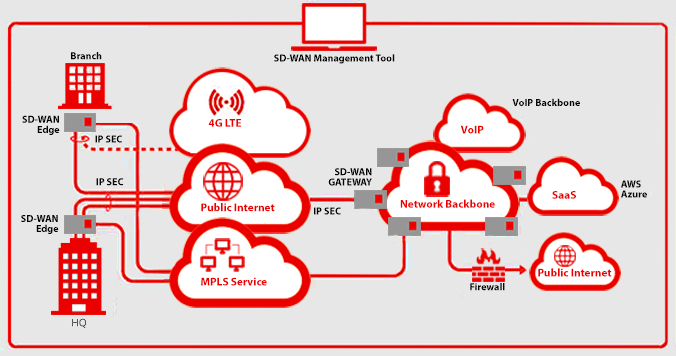 SD-WAN addresses these challenges by automating the ongoing configuration of WAN edge routers, running traffic over a hybrid of public broadband, private MPLS links, and other WAN links such as LTE. With SD-WAN technology, networks use application-based routing instead of packet-based routing, which allows businesses to rely on consumer-quality internet (which is less expensive than a private network) but with improved performance. This provides significant cost savings compared to MPLS. Triton offers SD-WAN as an overlay technology, independent of the physical network, that provides the consistent, cloud-based application performance your users demand at every location. And with all best-of-breed carrier services to choose from, we can get quality fiber wherever you need it. Should you consider SD-WAN for your business? The newest SD-WAN solutions include additional broadband flexibility, improved self-service monitoring and control options, and managed services that automatically optimize application performance, lower costs and simplify network management. Management of all business and security policies can be centralized into a single interface. Just set business policies to determine the most effective way to dynamically route applications to multiple locations.